Several US missile warships, over 800 sailors and a Navy SEALs team have arrived in the Black Sea to take part in the 12-day Sea Breeze 2017 naval exercise off Ukraine, which will include maritime forces from 16 countries. The multinational war games are taking place in the northwestern part of the Black Sea near the Ukrainian port city of Odessa. They will feature 31 vessels, 29 aircraft and over 3,000 troops, the Ukrainian Defense Ministry said on Monday. Naval forces from 16 nations, including the US, Britain, Canada, France, Italy, Norway, Poland and Turkey will practice “planning and conducting operations in compliance with NATO standards,” focusing on anti-submarine and anti-ship warfare, air defense, mine clearance and hostage rescue. The US Navy has sent its Ticonderoga-class guided-missile cruiser ‘USS Hue City’ and the Arleigh Burke-class guided-missile destroyer ‘USS Carney’, along with a P-8A Poseidon patrol aircraft, the Sixth Fleet said in a press release. Bomb disposal teams from the Naval Special Warfare Unit 2, otherwise known as Navy SEALs, as well as combat divers are also expected to arrive in Ukraine, as are some 800 US sailors and marines. “We’re building strong relationships here which are crucial to peace and stability in the region,” said Captain Dan Gillen, a commanding officer of the ‘USS Hue City’. “Our presence and participation in Sea Breeze bolsters confidence and reassures our allies and regional partners of our commitment to security in the Black Sea,” he added. The exercise “is designed to enhance flexibility and interoperability, strengthen combined response capabilities, and demonstrate resolve among allied and partner nation forces to ensure stability in the Black Sea region,” the US Navy’s press release stated. The Sea Breeze drills “provide us significant support in achieving NATO standards… and manifest the desire of the Ukrainian people to enter the family of civilized peoples of the world,” he said, according to the Ukrainian Defense Ministry. 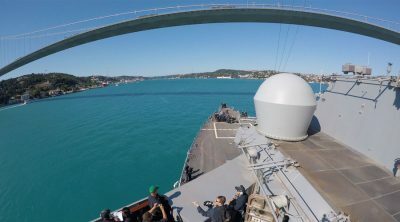 Since the spring of 2014, NATO warships, including US missile cruisers, have been patrolling the Black Sea on a rotational basis, never leaving the area unattended. The increased presence of NATO naval forces near Russian shores has led to mid-sea encounters involving American warships and Russian military aircraft. Last year’s edition of Sea Breeze took place in Bulgarian waters, and involved as many as 25 warships, two planes, two helicopters and some 1,700 personnel.